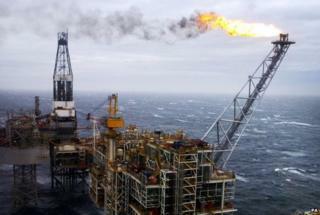 Export sales from Scotland's oil and gas supply chain grew to £10bn in 2013, according to figures from Scottish Enterprise. It calculated that this represented an increase of 22% from the previous year. The research indicated that more than half of work in this area resulted from overseas activity. The study covered companies which do not extract oil and gas but support those which do. Scottish Enterprise found steady growth in the importance of international contracts. These had risen from 31% of sales in 2002 to 50.2% in 2013. The figures were revealed at the Offshore Technology Conference at Houston, Texas. Scottish Enterprise Head of Oil and Gas David Rennie said: "Scotland has built up a global reputation in oil and gas expertise over the past 40 years, and these latest results clearly indicate that our skills and expertise remain in growing demand across the globe. "Helping our supply chain to develop opportunities in new markets is a key focus of Scotland's industry-led oil and gas strategy, and our attendance at OTC this week is a further opportunity for us to showcase our strengths in this sector to the global marketplace." North America remained the top region for international sales with sales up by a third to £3.6bn, followed by Africa where sales almost doubled to £2.3bn. The USA remained the main international market for international activity with Angola and Norway rising to become the second and third largest markets. Over the next five years the USA will continue to be a key country alongside Angola, Norway, Nigeria, Brazil, Australia, the UAE, and Malaysia. Africa, the Middle East and the Asia Pacific region are forecast to provide the most opportunities. Energy minister Fergus Ewing said: "Scotland is leading the way in the world of oil and gas and has a clear competitive advantage in this truly global industry. "There are huge opportunities open to us internationally and we are determined to make the most of them."